Out of Home International are working to project Greene’s Tutorial College, directing a multi-format regional outdoor campaign. The campaign, primarily aimed at those in Oxford and neighbouring areas, ensures the advertisements are geographically targeted by using bus and rail station advertising. Out of Home International are working to project Greene’s Tutorial College across the region’s students, directing a multi-format campaign aiming to grow the school’s sixth form and A-level retakes students. Oxford railway station will be used to present 4-sheet billboards from the 12th August, which will remain on display for 4 weeks. Working in conjunction, Oxford-based buses will exhibit streetliner adverts from the 19th August, also remaining in place for 4 weeks. 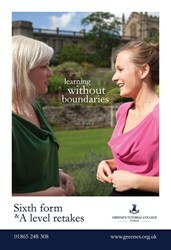 The artwork adopts an Oxford blue and white colour palette, featuring a photograph of a Greene’s student and tutor within a picturesque college setting, overlain with the ‘learning without boundaries’ strapline. The college crest, logo, website and contact telephone number are positioned within a white and dark blue box, promoting the college’s ‘Sixth form & A-level retakes’ facilities. Tracing its roots back to the late 1960s, Greene’s Tutorial College is the oldest tutorial college in Oxford, having helped to educate approximately 15,000 students since 1967. The college provides a transition between the guided learning of A-level and the independent study required at university. It offers intensive tutorials for revision, examination re-sits, university entrance preparation in the U.K. and U.S. and throughout the world, as well as full-time sixth form education. Greene’s is also a fully accredited examination centre. With an extensive portfolio managing campaigns in the education sector, Out of Home International are able to ease Greene’s Tutorial College through the marketing landscape in order to reach an effective solution. The campaign, primarily aimed at those in Oxford and neighbouring areas, ensures the advertisements are geographically targeted by using bus and rail station advertising. 4-sheet billboards allow high-frequency coverage across high footfall areas of the station, while bus streetliners convey the College brand beyond the station, and through outdoor public spaces, reaching pedestrians and road users alike.